On 18 March, to mark the UN international anti-racism day, trade unions in Britain supported a demonstration held in London. Tamil-speaking people also took part in this demonstration with a sizable contingent. In addition to putting forward slogans against racism, they also demanded rights for refugees such as an end to deportations, closure of the detention prison centres, etc. Significantly, they also demanded that the health service in Britain remain a public service free at the point of use. This is a decisive step by the Tamil community living in Britain towards linking up with the struggles of the working class in Britain. In a desperate attempt to prevent such solidarity a few members of the racist organisation English Defence League (EDL) turned up with British flags. This small number was held back by the police. But to the surprise of everyone a few also turned up with the Sri Lankan flag. With slogans such as “one nation, one country” they mirrored the EDL in their outlook and behaviour. They were standing alone. But to any onlookers’ amazement they started to abuse Tamil protesters in filthy racist language including shouting “go home – you are a terrorist”. They shouted that they are all Sri Lankans. It was clear that they came to provoke the Tamil protesters. The news that the Tamil Solidarity campaign is organising to take part in this demo was very well circulated in social media. These racists had organised to try to oppose Tamil working class and young people taking part in the anti-racist protest. When a few protesters pointed out the bankruptcy and danger of their slogan and questioned why they were there, their answer was to shout aggressively that they have a right to be in Britain but ‘Tamil terrorists’ do not. Protesters could not believe what they were hearing from Sri Lankan flag holders. There was a threat of physical attack amid the pure chauvinist filth they shouted. 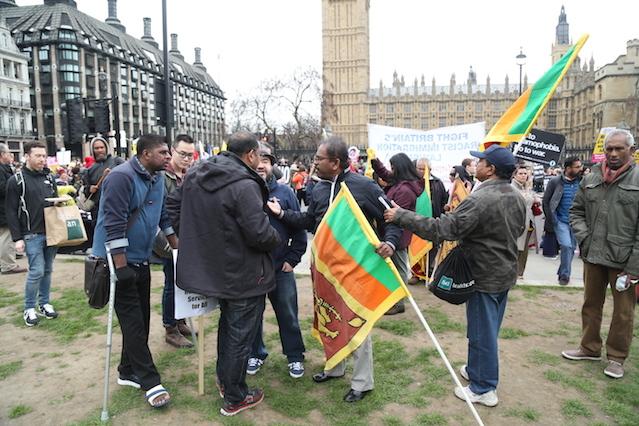 Anti-racist protesters in Britain for the first time learnt about the character of Sinhala chauvinism. They also displayed hand-written signs demanding the release of Wimal Weerawansa. They shouted that the Ranil-Maithri government is a selling out the country to imperialism. It was clear that the Wimal faction of the former JVP is now mobilising with the same technique as the racist BBS (a racist Buddhist organisation). The JVP for a long time pretended to be on the ‘left’ with some Marxist rhetoric. Then splits in the JVP and the formation of the Frontline Socialist Party exposed the long-time bankrupt policies and stand of the JVP. The current JVP may claim that they have separated themselves from the Wimal faction. However they have so far made no attempt whatsoever to change any of their old stance, particularly on the national question. The lesson also need to be learnt by the FSP, if they are to help build a united struggle they must come out clearly about their position on national question and how they differs from old JVP’s position.